How to Fix Short Circuits. In electrical devices, short circuits are usually caused by a breakdown in a wire's insulation or when another conductor is introduced and causes the electricity to flow in an unintended way. To fix this problem, you will need to replace the wire. Determine which appliance has a short in it. You can do this by unplugging all of your electrical devices that run on the circuit that keeps breaking. Plug in one, and reset the circuit breaker. If the circuit breaker doesn't trip, then that device is fine. Move on to the next and check it using the same method. Continue doing this until you find which device is causing your circuit breaker to trip. Unplug the device before you begin fixing its short. Locate the wires in your device that are causing the short. Remove the wire by using a soldering gun to melt the solder holding the wire to the contact point and pulling the wire free. Make a new wire to replace the damaged one. To do this you can go to your local hardware store and purchase wire that have already been cut and prepared. These wires will come in specific lengths, so if you want a length that's different from these you can make your own. Unwind a length of insulated copper wire from a spool and cut the wire so its the length you need. Use a utility knife to remove some of the insulation from both ends of the wire. Expose enough wire so that you can easily attach it to the contact points. Put some solder on the contact points and put the wire's exposed ends on them. Use your soldering iron to attach the new wire to the contact points. Push the device back in, and reset the circuit breaker. If it doesn't trip, then you have successfully fixed the short. 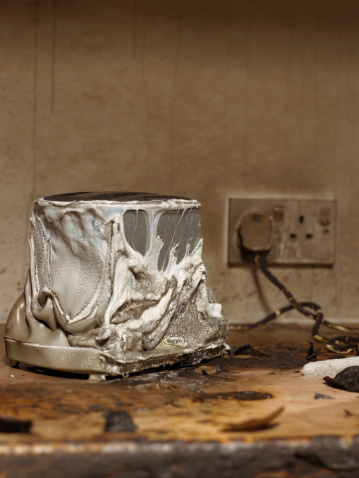 What are the Causes of an Electrical Connection Melt?